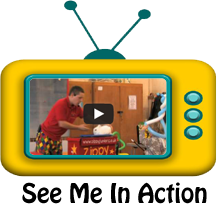 Zippy Junior is a fantastic comedy children’s entertainer in Hanley and Staffordshire. He is young, energetic and puts 110% into every performance. He has been a professional entertainer in Hanley for over 12 years. He uses live animals in his performance and is the number 1 choice when it comes to a wonderful entertainer in Hanley. He can offer a magic show, disco, party games, dance routines, circus skills workshops and karaoke. He will ensure that the birthday child is the star of the show. His shows are perfect for the age group of 2 to 8yrs. He holds a CRB Disclosure, PLI Insurance and all of his equipment is PAT tested. Zippy Junior has no limit on the number of guests you invite. He will make every child at your function a balloon model of their choice and colour to take home. Zippy Junior is very professional and is a full-time entertainer in Hanley. He is perfect for birthday parties, christmas functions, christenings, weddings and school functions in Hanley. He has many different package options available, with the most popular being the 2hr stress free show. This includes a 45min magic show with live rabbit, 15min balloon modelling for every child, a disco with party games, dance routines, competitions and mini circus skills. This is designed to take the stress off the parents. All you have to do is provide the children – Zippy Junior will take care of the rest. Zippy Junior is one of the most popular children’s entertainers in Hanley and the surrounding areas of Stoke On Trent. He is the chosen magician for Liverpool FC and provides his services on a yearly basis for the players’ children’s christmas party.